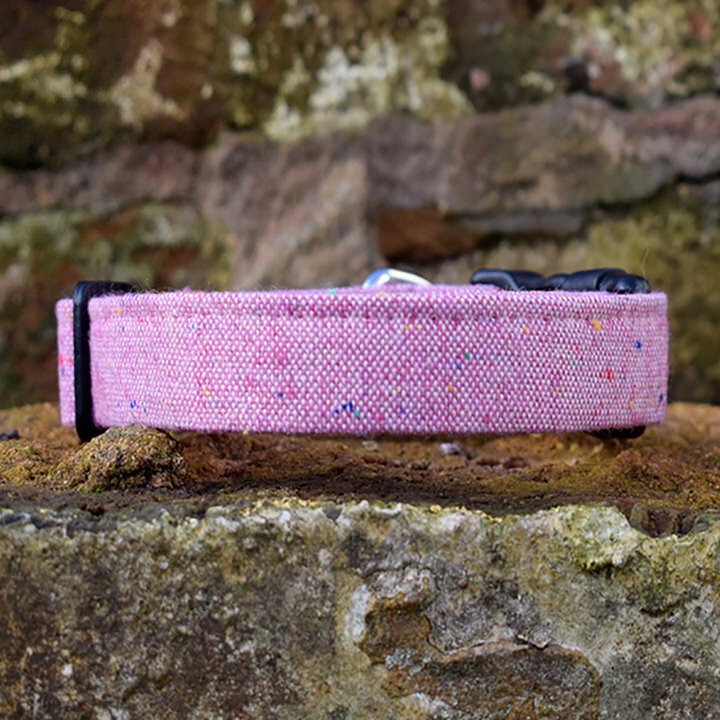 The Boots & Bones Pink Marl Dog Collar is made from a fabric outer with a nylon core for strength, and reinforced chrome fittings. To find out which size to order, simply measure the exact circumference of your dog’s neck with a flexible tape measure and add 1″. A dog collar should be a snug fit, whilst not being too tight. If your dog is on the edge of two sizes, always go up a size. Small Narrow – Adjustable between 8″-12″ & 15mm wide – Suitable for larger Chihuahua’s, toy breeds & similar sized dogs. The metal buckle is not suitable for this size due to it’s weight. Medium Wide – Adjustable between 12″-19″ & 25mm wide. Suitable for Beagles, Springers, Staffies & similar sized breeds. Although we endeavour to make your Pink Marl Dog Collar easy to clean, unfortunately it is not suitable for the washing machine. It should be handwashed using warm water and air dried. (Not tumble dryer safe). It is entirely the customer’s responsibility to ensure suitability of our products for your pets, we recommend that you check daily for any signs of wear. Our products are not recommended for dogs that pull excessively.